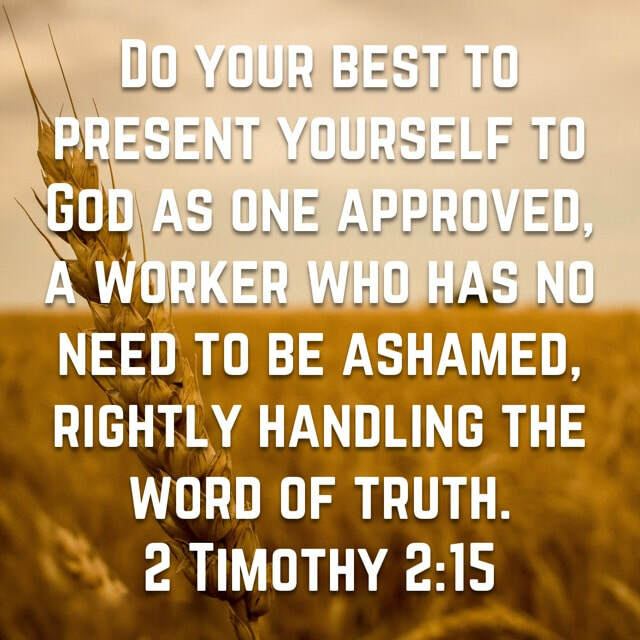 2 Timothy 2:15 ~ "Do your best to present yourself to God as one approved, a worker who has no need to be ashamed, rightly handling the word of truth." Christians have been given a great task. We are expected to take the gospel to the world. When believers stand before God there will be an audit of sorts, inspecting to see how you spent your time, resources, and heart into the spreading of God's Word. 2 Timothy 3:16 ~ "All Scripture is breathed out by God and profitable for teaching, for reproof, for correction, and for training in righteousness,"
​Notice that Paul doesn't say, "some scripture," he says ALL is the Word of God. The problem comes when men use scripture to fit their wants, desires, and schemes, but look at what scripture is good for. Teaching, to express disapproval, to correct, and to train people how to be like God.